We had two children in diapers when we started dating at home. All three of them were in bed by 7:00 pm and generally we could count on a quiet house around 7:30. We weren’t getting a lot of sleep at night, they surrounded us morning, noon, and night, and they needed us constantly. In that season it seemed as if our only way to stay connected regularly was to make our home a setting for us to date. So we shoved the crayons off the table, tucked the dirty laundry under the couch, and maybe lit a candle or two before sitting down to dinner; just the two of us. These evenings turned into a cookbook, as many of you know, and more importantly they sustained our marriage in a time where we had to fight with intention and battle through the exhaustion. Now our three are in school. They are much more independent, waking up to pour their own bowls of cereal or toasting their own bread. They can handle putting on their pants, packing up their bags, and while we do still step on small toys on an almost daily basis we don’t have to be afraid that any of them will put them in their mouths. They’re in bed by 8:00 but the house is still buzzing with little chatter until 9:00. They have so much to catch up on after being away from one another all day. Let me just pause for a moment and assure those of you who are reading this with a baby on your lap or a toddler pawing for your attention, that someday those little ones will grow older. They won’t demand as much of you as they do now and they will grow into amazing little people and you get to watch it all. It’s as wonderful, hard, and fulfilling as you hope it will be. Gabe and I have had a clunky return to dating at home this year. We would set aside the time but without having a book to write and honestly, I had needed a bit of space from it all, it just seemed too hard. But the necessary things in life are often the hardest and our failure to date has, at many times, left us feeling very distant and disconnected. It shows up in small ways like when I take a comment he makes and meet it with defense because I’m feeling guilty for not making more intention to connect. Or when I say something I shouldn’t in a tone that nobody wants to hear because I’m feeling vulnerable. We have felt the effectiveness of our weekly dates and can now quickly recognize the difference in our friendship when we connect regularly and when we don’t. It wasn’t until we released what those date nights used to be and started to see that now, in a new season, they can be something else completely. The point isn’t the multi-course meal eaten while three kids sleep in the comfort of our home. The point is connection and we must actively pursue that in any and every season for our relationship to continue to thrive. What once worked so well for us may look different now that so many other things in our life look different. Once we embraced that thinking about dating, it felt new, exciting, and possible again. We still sometimes sit down to our table once the house is quiet, with a glass of wine in hand and a meal that suits our tastes. Sometimes it’s a simple picnic on the beach that is now just a short walk from our new home. Or sometimes it’s going out to breakfast after our three kids are off to school. The point is still the same it just may look a bit different now. No matter the season the point is to continue to pursue one another in friendship. As long as that is the constant we can weather any season. This particular date we packed a simple picnic and walked down the beach. Most of the items in our basket I picked up from the store like cheese, crackers, pickled things, (my most favorite picnic item) fruit, and wine. I did manage to make us a simple salad. One that has been on repeat since. It’s a mix of all things green: charred green beans cooked until sweet, peppery arugula, green lentils boiled with a bit of bite still remaining, and pistachios. And then, though not green, lots and lots of seeds – toasted until deeper in color and fragrant. The type of seeds depends only on the contents of my pantry but I have found that fennel, cumin and sesame all play a vital role. If pistachios aren’t readily available, pumpkin seeds do nicely as well. We top our salad with large flakes of smoked trout, but I’ll leave that up to you as well. As I mention in the video below, the picnic really isn’t about the food. Of course that’s what often inspires the trip or gets me giddy about it all in the first place but once we’ve set up the blanket, unloaded the basket, and cleaned our plates, that’s when the purpose of our time reveals itself. Food and a bit of wine become the icebreaker and ease us into the point of it all – connection. It’s why I love food so much; it gives us a purpose for gathering around the table, or in this case, the beach. What happens while the food and wine are being enjoyed is what matters most. This post was kindly sponsored by Mirassou Winery and they are thrilled to be giving away the picnic basket and blanket you see in the images (not exactly the ones I use, yours will be brand new, I assure you) as well as a few of my favorite picnic items (most made right here in Seattle) including smoked olive oil, Boat Street Pickled Raisins, Ayako & Family Plum Jam, and Salted Chocolate Chip cookie mix from yours truly. Cook the lentils in salted water until just tender. Drain them then run under cold water to halt the cooking. Set the lentils aside. In a large skillet set over high heat add a couple glugs of olive oil then toss in the green beans. Sprinkle in a hefty pinch of salt then let the beans get a nice char on one side before giving them a stir. Continue to saute in this way until the beans are tender and charred on most sides, about 5 to 7 minutes. Let the beans sit for a moment while you make the vinaigrette. In a large bowl whisk together the shallot, dijon, honey, vinegar, and olive oil. Season with a bit of salt and pepper to taste. It should taste bright and briny as it will taste more mellow once all the ingredients have been added. To the bowl add the green beans and lentils. Toss to combine. Finally add in the toasted seeds in whatever variety you have but I really love a sesame, poppy, fennel, mustard and cumin mixture. Nigella seeds are really lovely too if you happen to have them. Also add the pistachios and finish with a bit of flake salt. If you are packing this for a picnic line the bottom of your container with arugula then top with the lentils. 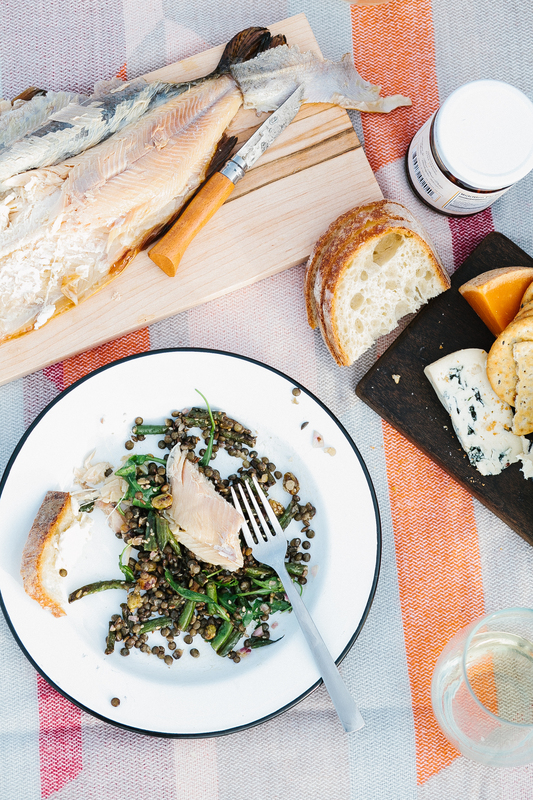 If a picnic is not in the plans then simply toss the arugula in with the lentils and finish with big flakes of smoked trout. Serve immediately. At the picnic you can fillet the trout and top the salad there. Serve with Mirassou Sauvignon Blanc. I loved this post, it really resonated with me. Thank you for your honesty, and for sharing your family with us! Thank you for being so open about your parenting journey as a couple. I appreciate seeing the struggles behind the pretty pictures. Thank you for the chance for a giveaway! i LOVE reading your blog! I have tried SO many recipes from this blog, and I think I’ve made every single item from your Modern Comfort column over at Food52, and I’m working my way through your cookbook at the moment. I just had the apple cake for breakfast this morning, and we had the Caribbean chicken legs and sweet potatoes over the weekend! Everything you make is fantastic! I’d love to enter your giveaway, too! Thanks for everything you do! Thank you for reminding those of us with kids how important it is to make time to foster our relationships with our significant others. I love this recipe too, going to make it tonight and attempt my own date night! Thanks for a chance to win a wonderful giveaway. And thanks for the great recipe as well. Love your book! My husband and I had date night at home when our kids were little, our oldest is 23 now! I love your cookbook. Cooking for those we love is such a sweet way to serve them and connect and your book is a great encouragement for just that. Thanks for sharing and for the delicious recipe. Lovely, my guy and I regularly cook/prepare food for outside adventures. The recipe is something we will definitely make, and the fish looks amazing!! This is a super gift, thanks for having the contest! This looks fantastic. I just got your book in the mail and I can’t wait to put it to good use! We are still harvesting TONS of green beans here in Poulsbo (weird October! ), so this recipe is just what I needed for something new to try! Thanks. I love this recipe! My boyfriend and I picnic at the lake at least once a week to relax. Love it! Thank you for a lovely and inspiring post. We love “fried” green beans, but never tried them with Lentiles. Looking forward to trying this! What a great post–so, so true! This looks lovely! Thank you for the giveaway! There’s something about fall and lentils that just feels so right. Thanks for the opportunity to win! I told my husband this weekend, one of the best things we have done as parents is make the kids think it is a treat to read in bed. Sometimes, we can get away with putting them to bed early because they don’t have to go to sleep, they have a flashlight and they like to read. Leaves more time for us to be together! Thanks for your ideas that make it just that much more special to spend time together. No matter how long one has been married, this is such a good reminder. Wise words, Ashley. And the salad is divine. This salad looks fantastic! Can’t wait to make it. Thank you so much for sharing your “date night” ideas! We have two 30 something daughters with busy husbands, and multiple little ones running around, and my husband and I totally understand the “continued connection” needs. Your menu, ideas, and family togetherness is awesome. Thank you, thank you, for sharing all of it!! My husband and I have been married for only a year, and we don’t have any kids yet. But we work more or less opposite schedules, and it gets crazy. A few months ago (after reading your book, incidentally) we made a commitment to go out for coffee once a week. It’s our holding ground, and what makes it possible to keep this crazy schedule going. The salad looks fantastic. Everything you make looks so delicious! Usually, my fingers flit and then fly by most emails/blogs. Not this time! You are right on the money–staying connected to your partner is crucial. We have 2 out of the house and 1 to go. We love them and miss their company, but not having them around gives us the opportunity to bring forth the memory of falling in love 32 years ago. The candle still burns after all this time! Thanks for the reminder that you can keep evolving what “dates” look like as the demands on your time change – with life, with children growing up, etc. This looks lovely – we love charred green beans. This looks like the perfect recipe to use up the arugula and green beans I just got in a CSA box! YUM!! That was my response just reading the name of this dish! Beauty, health, delicious… Thank you so much for all your inspiring ideas!! This salad looks wonderful. Not a fan of smoked fish but my husband would love it. The cheese, bread and other items look great. I love the idea of taking the time. No matter how long you’ve been married sometimes you just have to take time out of busy schedules and break bread together. Thank you. This is such a beautiful reminder of the way food brings us together. You write with such sincerity and vulnerability. I don’t have kids but have felt the same struggle of allowing life’s busy seasons to get in the way of connecting and that same distance has creeped in to my life. This post touched an important note in my own life especially as I am doing my best to be intentional about connecting with loved ones too. Thanks for your beautiful words! I’m fairly new to your website but along with the wonderful recipes your sharing of commitment was very meaningful. I too love to share food with family and friends. Before my husband of 38 years passed away 14 years ago, we shared many date nights. Now. I share with family and friends. Can’t wait to try the salad and apple pie. Thank you for the creative recipes. Beautiful post, which hits very close to home for me right now, having just moved into a new house with a toddler…man, my husband and I could use a break to reconnect right now. It is difficult to keep in mind the long game during the tough days, but we try. This looks delicious! Everything looks amazing- including the basket & blanket! This has inspired me to pack a picnic this weekend. That salad looks delicious! A simple picnic sounds wonderful! This giveaway is lovely but so are your words. Thank you for always being so inspiring and vulnerable with your readers, it’s really something special! I love picnics in the fall when it is finally possible to sit outside and not have sweat running down my face! The salad is brilliant — easy and yet sophisticated. And, cooking aside, the philosophical part of your post rings so true! Thank you on both accounts!!!! would love to have a chance to try your cookie mix! The salad looks delicious, but more importantly your thoughts on connecting ring so true. I recently bought your book and look forward to making our own date nights at home! Beautiful sentiments, beautiful photos, beautiful food. Thank you! 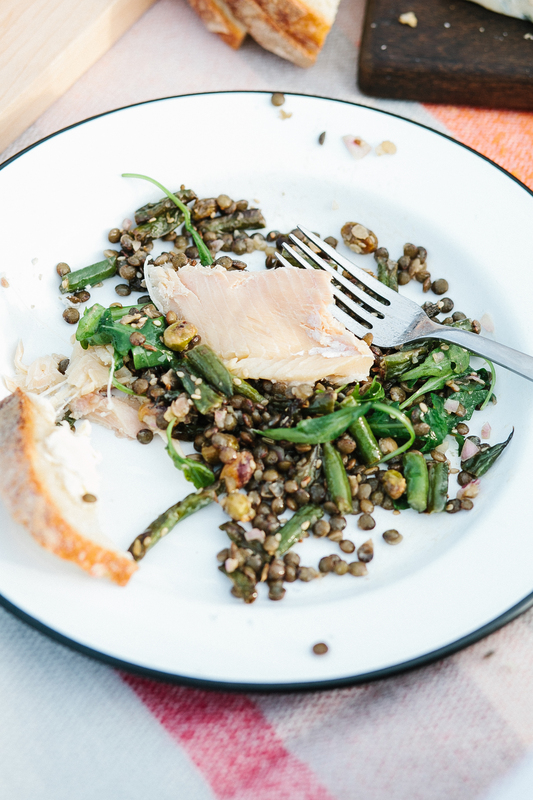 Love lentils and green beans so I’m excited to try this recipe! Looks delicious! I especially liked this post – it helped remind me of the things that are important in a relationship and that relationships will not always be a piece of cake! As always, your food looks fantastic and how fun to picnic at the beach. I have all the ingredients for this salad & a husband that would love to share it w/ me. Thanks for the inspiration. 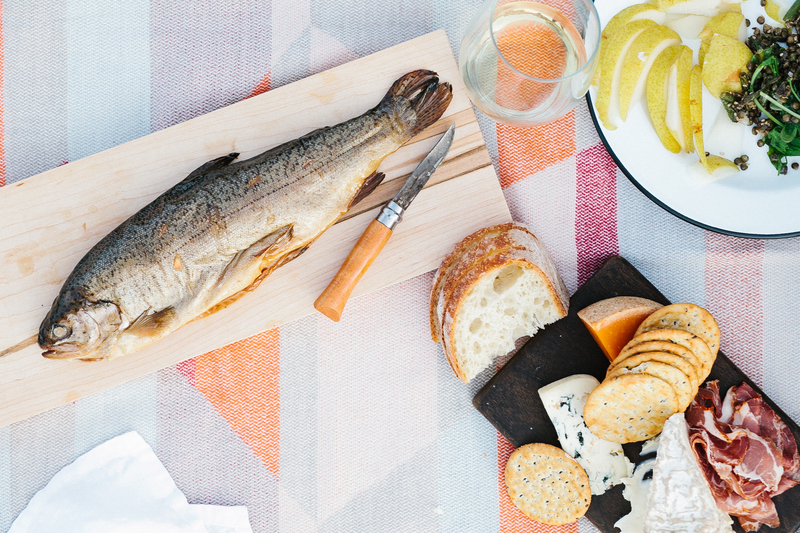 Where do you get your smoked trout (or do you make it)? I’m also in Seattle, would love to know if you have a specific place you get it! I get mine from the Fresh Fish Co. in Seattle. It’s amazing. I’ve been following your blog for years…Perfect Fall Sandwich is a favorite in our house and the Salted Chocolate Chip Cookie. With a three year old and one on the way, we need a picnic more than ever. Ashley – Thank you for the beautiful reminder to reconnect with my husband (and in such a simple but special way). Our kids are now mostly grown – 3 have left the nest and 2 of those have come back; and the “baby” is finishing high school. Probably more important than ever to carve out some special date time! Beautiful! Can’t wait to try this! a cozy winter picnic on the beach, with hand pies of course, sounds good to me, when can we go? Picnic dates at the beach are my favorite! And this salad has everything I love. I’m thinking it would be excellent with some dukkah on top. I really like this recipe’s way to use lentils! This sounds really good and tasty! Love new recipes with lentils! Thank you! What a great date night post! Love charred veggies. I am looking forward to trying these and love the blanket and basket. Picnics are appopriate in every season of year and life! Your blog is so lovely, I’ve been a fan for many years. I look to this site for the best photos and inspiration on any given day. Your words are special and you are so genuine. Thank you for sharing your life with us! Wow, that looks amazing! My husband and I live 9 minutes from the beach. We will have to do this together! We have also fallen victim to dating in while the kids were sleeping. We went to the movies alone for the first time in three years just last week! I also absolutely love that blanket! Do you happen to know who makes it? I would love to picnic with my husband. Beautiful setting for a picnic! A blanket, a fire in the fire pit, twinkling stars, delightful food and the one you love…. Oh my son turns two in a month and my husband and I are sooooooo in need of this kind of date night! Love your classes and would enjoy this gift! Love the picnic ideas & the salad. Mmm! This is amazing. I love your blog and how honest you are. I got your cookbook for Christmas and it has become a fast favorite. My husband and I made your green curry tonight and added in the bahn mi meatballs from your blog–absolutely amazing. Everything we’ve made has been insanely delicious. Thanks for sharing your life and recipes with us! Beautiful post! I’ve been enjoying picnics through the summer, and it’s nice to be reminded we don’t have to stop going on them once fall begins. still warm here in SF so would be put to good use! I love picnics! What a fun giveaway. “It is around the table that friends understand best, the warmth of being together”. Sometimes the table is the beach. Such a lovely post! I love the images your post conjures up of your picnic; the food is important, but not the most important part of it. Food can bring people together and open doors in the most amazing way. I love all of your posts, inspiring in so many ways! I always loved your blog posts about dating your husband. It is so important to connect as a couple. Your kids may feel like the centre of their universe, but we are only caretakers helping them to become sufficient and successful in their own lives. You are a great example to your kids and others. Wow! Thank you for the inspiration: my husband and I definitely need to do this. Your recipes always make my mouth water! Pickled picnic snacks are the best! Yum, looks amazing. I live in MN and I think I’ll add some smoked whitefish from Lake Superior! My husband and I are cooking through your book one date per month. Great food, great fun, great written wisdom. Continued blessings to you and yours! One of the most important aspects of a healthy marriage is giving each other time to connect. My husband and I are 22 years in, with two boys. When they are little you think you are so busy and now I have a 13 year old and a 9 year old and we never seem to slow down. It is more important now than ever before to spend time together “on a date,” I guess because that kind of time is so precious. And it is really easy to just let the business of life take over. I always enjoy your blog! Today was wonderful, I especially value your candor. I can hardly wait to make the salad! Oh how your timing was so poignant! Our seasons are too changing; and while we are excited, there is a tinge of nervousness that resides in our hearts and minds. We are trusting our Guide and trusting in what we have in each other. 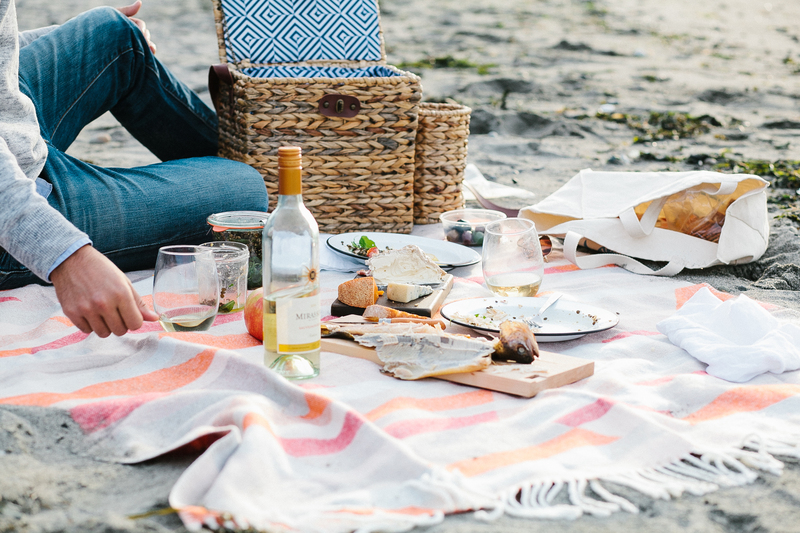 I will say with assurance, a picnic basket with a lovely bottle of wine will definitely make for a good moment – maybe multiple – in this new season. 😉 Thanks always for sharing and for truly caring! Beautiful photos as always. Date nights at home is a wonderful idea, since it’s so important to make time for each other. i look forward to your blog posts – they have calmed me down at times and given me hope that a marriage, buried under the beautiful, yet heavy, weight of children can still be connected and rooted in friendship. Love the post and excited for a new lentire recipe. Thank you. I’m a homebody and my husband has learned that if he doesn’t gently insist on a date night that I’ll let weeks go by without thinking about it. There is really so much to be said for the refreshment and calm of intentional time together. Thank you for your encouragement in an important tank-filling practice together! A great reminder that life changes with the maturation of kids and the friendship with your spouse needs to be flexible to respond to all the variations life throws at you. Thank you! I love hearing from moms who are just that much farther down the path than I am. The recipes in your book in the section called A Touch of Thai would be the first thing I’d try cooking! I have yet to “date my husband”…but my boyfriend and I date plenty, and I would LOVE a picnic basket with which we could continue this lovely tradition! I can’t wait to try this recipe. I ADORE you and your book, and WINE, and pickled raisins, and your cookies 🙂 Plus, i love a good picnic on a beach with friends (or hubby)…now,hmm, where can I find me a good beach….. I or should I say we just bought your book. I’m so excited to share these recipes with my family. And I’m also excited to start dating my husband again. It is can be so hard to stay connected. With my husband working full time, me a full time mom and new student. It can be overwhelming at times. But I’m truly grateful you wrote this book!!! Thank you for all that you share. Looks amazing! You guys continue to inspire. Hugs. Beautiful post, Ashley. Much needed encouragement as I currently have a toddler who still needs me quite a bit and feeling the need to reconnect with my husband more. What a wonderful practice for spring or fall- a picnic with someone you love! I would even enjoy an indoor picnic with some lovely wine, during the Chicago winters! Thank you for the great book, recipes, and information! Great post and ideas – we don’t think enough about putting effort and time and thought into really enjoying each other and relaxing together as much as we used to. What a beautiful picnic! Would love to win this one! This is perfect! I was looking for a recipe for supper club tonight and also something that would fit into my diet, this is spot on, thanks! This salad looks delicious and easy! Thank you for the recipe, and the chance to enter the giveaway. There’s someone in my life who has never been on a picnic, so if I’m able to win, I know exactly whom will benefit! adorable!! picnic dates are my favorite! Hi, I really connected to your story having a 4m baby and a 2 year old. I’d love this picnic basket and blanket to use as the extra nudge we need to fight for a date night. Looks amazing!! I love this post. Very real, good stuff. The salad looks wonderful!! You have inspired me to try date night with my husband. my fiance and i bought a picnic blanket a long time ago with the intention of having regular picnic dates. they didn’t happen, not a single one actually, but we still have the blanket, so there’s still time! that picnic basket is so cute! this cold salad is right up my alley as well. looks yummy! Thanks for turning the idea of a picnic away from bringing the whole family – which is what we’ve been doing for years! I’d gotten so wrapped up in it having to be the four of us that I’d forgotten my husband and I were picnic-ing together loooonnnng before either of the girls arrived. What a gorgeous video! We’re so lucky to live in the PNW! Love how personal your posts are. I can always relate to them and not feel like I’m the only person in world with these thoughts and feelings. Thanks for being so honest. What a lovely spread and post. Thanks for sharing. That salad sounds perfect for a picnic. I think my husband and I will make it this week, and have a picnic on our porch. Thanks for the inspiration! The beach is beautiful. What a great quiet atmosphere for a date night. It is so hard to make yourself get away with your spouse. Our time gets so wrapped up in the kids. Thanks for sharing great ideas. I just sent this link to my husband, we could use the time together! I love your ideas – me and my mister now date-night-in, too, thanks to your inspiration. We both lead busy and demanding careers and it’s so important to give time to each other, even though it’s tough. Thanks for sharing your experiences (and recipes)! The timing is perfect. I am dating someone new and really like, so an indoors picnic would be an awesome date night. And I was just thinking to myself, I should do something other than soup with lentils. Really right on time. Thank you for sharing your heart – for your spouse and for your children. I love crisply charred green beans. I can’t wait to try this recipe. Thanks for the giveaway! This entire set-up is so beautiful! The food, the basket, and the truly lovely story of your relationship. Thanks for sharing. Ok, coolest giveaway ever. I’m totally in! Looks beautiful and delicious. Would be perfect for our nights in Malibu. What a lovely way to start my day….reading this has inspired me. I share your sentiments on food and fellowship…..to me, FOOD IS LOVE. You inspire me with your beautiful writing and food. I’ve been inspired! I had plans cancel this morning and was looking for what I’d like to fill my evening with… trying a new recipe sounds perfect! Love the book. I can’t wait to try this new salad. Your recipes never disappoint. I love lentils and green beans! Going to try this recipe soon. What a lovely reminder to continue to date as spouses. And what a great recipe to try as well! I would love to start a date night with my wife before our first baby comes. Due date is 11/20! Looks like a delicious picnic! I love your blog – I have made so many of your receipes! Can’t wait to make the green beans and lentils for dinner tonight. Yum! I’m so jealous of your beach!!! These types of comments are absolutely why I love your blog! My family has loved every recipe of your that I have made, and this one looks just as good. Thanks for so many great ideas. I love anything w charred green beans! Thanks to you and your beautiful cookbook, my husband and I have been doing regular date nights at home for the last 6 months. It really has made a difference in our relationship and how we connect. Thank you. As someone getting married in January, this post was perfectly timed. In all the madness, sometimes, you just need to be together. Thanks. Such a good reminder that making the effort to connect is so important! Your recipes always look so good and the few that I’ve tried have turned out well. This looks absolutely perfect! Just like your cookbook. Thanks for wonderful inspirations!!!! Thanks for such real and fresh encouragement! Love your website! Thank you for the beautiful honesty you share with us with every post. I cannot wait to pick up some green beans from the store to make this delicious recipe. Your thyme/parmesan sweet potatos from your book are a hubby (& toddler–hooray!) favorite. I’ll be taking my picnics from Green Lake to my living room floor this winter, but it still counts, right?! What a darling set! The weather here is Miami is just starting to become bareable (when it isn’t raining) and I have been aching to go on a picnic. My husband and I could use a date night and a picnic sounds like a really fun idea! beautiful photos! i’ve been looking for new ways to incorporate lentils again! I love the idea of charring the green beans, they look delicious. And thank you for the giveaway! Picnic dates are my favorite – there’s something about the outdoor atmosphere that automatically makes me relax. Oh! This all looks so lovely! I would love to win and thank you kindly for the giveaway! My husband and I ride our tandem every Thursday to a picnic spot in a park a couple miles from us. We would a beautiful basket and blanket instead of the cooler we use now. Your words ring very true: so hard to make the space and time to connect, but so hard to live without the connection. Thank you for the inspiration–from your table and your life. Cheers! This is such a lovely post and reminder! My kids are now tucked in bed by 8 and sleeping through the night. I’m inspired to have a glass of wine and a bite of cheese with my hubby while snuggling on the couch – it’s our version of a perfect mini-date! My husband and I love to have date nights!!! what a great giveaway! love the blanket. Green Beans are such an underrated vegetable! Thank you so much for the recipe! This looks amazing! Love that you suggested a wine pairing as well. I’ve been looking for a new recipe for French green lentils. This is the one! I’ve been planning a picnic date for my partner and I before she moves, thank you for the great ideas! That salad looks delicious! And I love the look of the picnic basket. Beautiful little video! Is that along the East end of Alki beach? Your blog and cookbook never cease to inspire. Thanks for a new twist on date nights. My husband and I are in a similar phase…the kids stay up later and home dates are hard to come by! I think you are right on about how food bring us together – – how it gives us a reason for gathering. I love your book. Keep doing what you are doing! What a great thing, to inspire us to date and to picnic in this beautiful autumn weather. I’m so glad that a beach walk is part of your days. Food for the body, mind and soul. I cannot wait to serve this to my wife of 35 years. Will blow her mind. Looking forward to future blogs and recipes. Priorities = lentil salads, wine, fish, quiet walks, loving with intention. So good. I am so grateful for your date night in book. In this season of financial tightness, this book made my husband and I realize it’s still possible to date even without going out! Thank you for sharing your family’s journey with us! I love how your date nights remind me to connect with the people in my life who mean the most. This is such a lovely dish, and that picnic basket is perfection. I’m in love with the wine holder on the outside of the basket. charred green beans on the grill are a favorite for us. Love the pic-a-nic basket! I totally agree on the disconnection when we don’t take time to make time for one another as a couple. We tend to focus on the parent side more. I guess, just like food and just like this picnic, relationships need an extra effort to work out well. I love charred anything, okra being my favorite but will try with beans next time. Love the simple and healthy salad. Green beans and lentils are two of my favorite things. I also appreciated hearing about your experience recognizing importance of connecting with your spouse during busy times – we don’t have kids yet, but I want to try to be intentional about making our home into a space where we can have intentional time together when the little ones are in bed. Always a pleasure to read your posts Ashley. Can’t wait to make this salad and maybe even have a picnic 🙂 Been enjoying cooking from your book greatly. We have rekindled our date nights thanks to your inspiration. They aren’t always fancy–dinner of popcorn and a movie in the couch sometimes–but they are always worth it. Thank you. How great that you guys have date night still! Looking forward to making that salad for my/our next date now! Looks great! I will definitely be trying out this recipe soon. Looks amazing! Can’t wait to make the salad. Ashley, needless to say, your writing is captivating and your recipes enticing!!! Can’t wait to enjoy this one ~ it’ll be on tonight’s menu for sure. Thanks for being so honest. I always think of food & wine as a way to ease into connection, also. A shared love for food reminds us of our shared love of so many other things. both kids in school and looking forward to some date nights. When they were little…child rearing was so physically exhausting….now it’s more of a mental game. My hubby and I love making recipes out of your book, and I’m always thrilled to see when you’ve posted something new to your new blog! Thanks for your honesty and candor about the ever-sharpening journey of marriage. This looks like a beautiful picnic! I love low key date nights, and the beach is always a favorite. Making this salad tonight. While it’s not quite outdoor picnic weather on the East Coast any longer, perhaps we can have an indoor date night picnic. My parents used to do that with me and my siblings when we were kids! The salad looks delicious. Thanks. What a brilliant giveaway! The recipe looks amazing and right up my alley. I love the idea of picnics in the park and on the beach, but have always thought of buying a basket as an indulgence that I can’t quite afford. Here’s hoping I get lucky! I loved this post – such true comments about raising children – amazing, hard and enjoyable all at once. The importance of carving out time for your spouse and changing how that looks based on the season of your life. I would love a picnic date night with my husband! The salad looks delicious and your photography is stunning! My husband of 36 years and I, with kids long gone, have what I call “Play Day” almost weekly. It can be a movie, a trip to Swanson’s in my old neighborhood, a hop on the ferry to Whidbey or, when we splurge, a weekend in Cannon Beach. The connection always improves and we can ignore obligations and chores and focus on having fun and remembering why we got married and still enjoy each other after all this time. Keep it up! Your pics are mouth watering! Can’t wait to try this! Where do I find that delicious smoked trout? 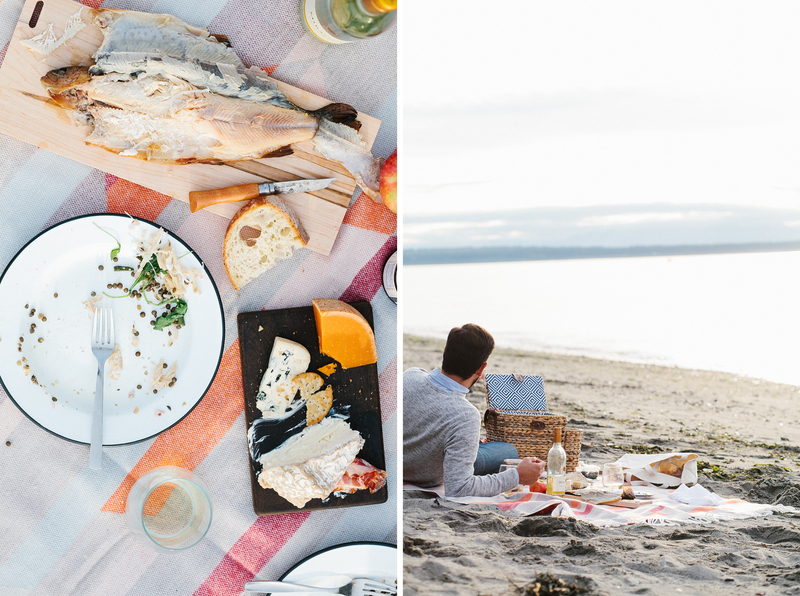 Ahhh, that’s my favorite kind of date – a picnic on the beach! This is a beautiful post, and the salad looks great. There is a special place we picnic at Lake Tahoe. This is the perfect salad to take while the weather still holds. What a wonderful post. This is a great outlook on relationships and it’s inspiring to see you so successfully pull it off. I’m also excited for a recipe that will get me out of my green bean stir-fry rut! I wholeheartedly agree that it is important to connect with each other, no matter how small the gesture or simple the words. A little random email or text, buying some favourite food treat (ie, stilton cheese!) can go a long way. We love a picnic on the beach, my partner will kayak there, I’ll make a nice little picnic and meet him there as he his pulling his boat in. It is so lovely! Thank you for your blog, it’s wonderful. I love the weekly dates! Great way to strengthen a relationship without it being complicated. The salad looks delicious. Can’t wait to try it. Thank you for being so open. My husband and I don’t even have kids and feel this way a lot just because of work. We have pretty regular date nights at home and they range from very simple to hours in the kitchen preparing a meal together. They are all special to me and are important for our relationship. Your book gave is the idea to make them regular. Thank you. How cute! I would love this! Thanks for sharing, we need to start up our date nights again too. That fish looks delicious! Thank you for sharing this post. It is inspiring to see how your relationship has grown and matured just as you’re children have. Plus the food looks so good! Love the post! Oh, I would love this! My fiancé and I have spent most of our 7 year relationship long distance, but that will change soon. I’m looking forward to seeing him everyday and to introducing regular dates back into our lives. Looks amazing – and what a beautiful blanket! I want that basket. I NEED that basket. Ack! Hope I’m not too late! Our girl is off to college; need to ask my hubby for a date-brilliant idea!! I love reading your comments on yours and Gabe’s friendship. It’s such an encouragement in my marriage to be intentional and pursue connection. And of course, the food you prepare always looks amazing… Thank you, Ashley! It’s great to hear how your relationship is evolving with the changes in your life and family. It’s a reminder to always be open to new ideas and a new way of looking at things. Cheers!! This whole post is beautiful — the words, the photos, the food. Thank you for sharing. What a gorgeous meal and time to connect! Picnics are my favorite! Am I too late? I’ve enjoyed reading your posts about dating your husband. Nice to see how it has evolved. Thanks for these words (and this recipe). I needed them both! Was so nice to meet you in CA this week! I love how you talk about seasons and how they change. Not in the weather sense but in your relationship, in your home. What used to look one way when you have small children changes and looks different when they get a little older. If something is important (date nights) you have to adapt. Thanks for sharing this beautiful video! Still dating my husband of 29 years! This looks amazing! Every year I resolve to have more picnics, but rarely follow through. I enjoyed your writing. Lots to think about …. This salad looks amazing, can’t wait to make it for my own date night! This is beautiful! 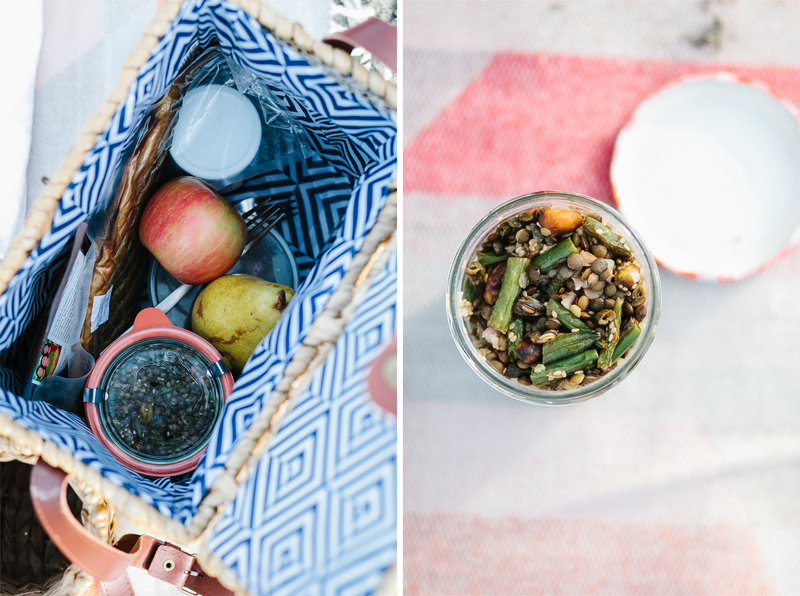 Definitely an inspiration to get outside with delicious picnic goods! This is beautiful beyond belief. I loved this post especially the importance of connection with your SO. Thank you for this inspiring message. What a great date night! The wine sounds spot on! I’m always encouraged by your story. Thank you for sharing it so openly. And that salad looks divine! What a beautiful picnic.